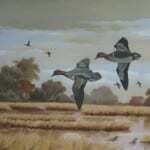 24″ x 36″ Ducks in flight signed by Gaetan (Guy Coheleach). 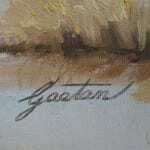 This is one of his early works. Buyer pays for shipping. Guy Coheleach has had one-man exhibitions at major museums in 19 cities across America from New York to Los Angeles. 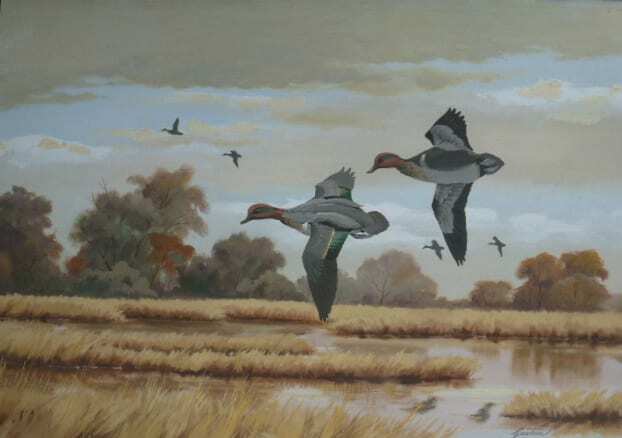 His paintings have received the Award of Excellence of the Society of Animal Artists an unprecedented eight times. Curators and professors of fine art award this most prestigious honor from museums and universities across America. The subject of two films “Guy Coheleach and the Bald Eagle” and “Quest: An Artist and His Prey”, Coheleach has also been the focus of articles in “Reader’s Digest”, “Saturday Evening Post”, as well as numerous regional art and wildlife magazines. “The Big Cats: The paintings of Guy Coheleach” by Abrams was a book of the month Club selection in 1992. Both it and his “Coheleach: Master of the Wild’ are out of print. “Guy Coheleach’s Animal Art” by DDR Publishing is still in print.In 1972 an elephant in Zambia ran him down. “This is exactly what has made him one of the best wild animal painters in the world admired by both scientists and art critics,” says Pat Robertson in Sporting Classics. His endowment at the University of Tennessee provided about six full scholarships to the School of Wildlife Management each year.